The beginning of baseball season; it really makes for a great time of year! Often you will hear people will describe the way baseball activates their senses, from the smell of hot dogs and freshly cut grass to the sound of the crack of the bat and the ball hitting the mitt. It's hard to deny the affect baseball has on people that can't be duplicated in other events. For decades, baseball has been heralded as America's favorite pastime. However, in recent years, one could argue that our mobile devices have become our culture's favorite pastime; more specifically, our iPads. Along with that culture shift we've witnessed the progression of using this new technology in sports over recent years. 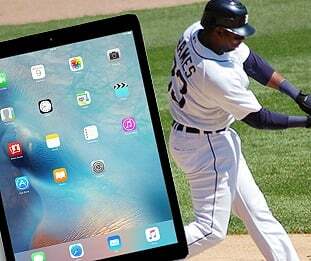 All of this led to a cool announcement last week, that Major League Baseball (MLB) would be partnering with Apple to supply Major League dugouts with iPad Pros. This partnership was struck shortly after the MLB decided to remove its ban of all mobile devices from the dugout (including smartphones, laptops, tablets, etc.). There is a little doubt that this partnership will do wonders for helping streamline the game and make real-time data more easily accessible. One of the rumored features and tools that this partnership will enable is a custom app fittingly named MLB Dugout, which will allow managers to access performance statistics that were previously not available in real-time. For instance, they will be able to quickly access spray charts that will show where hitters tend to hit the ball on the field. This will allow the manager to make defensive adjustments based off of where on the field hitters tend to be more active. In addition, managers will have the capability to analyze historical data between pitchers and hitters to project performance and potential outcomes. That feature will give the manager the opportunity to decide whether or not they may need to go with a new pitcher or bring in a pinch-hitter, depending on the circumstance. These are just a few of the features that will be used on a daily baseball during the 2016-2017 MLB season. It goes without saying that technology will continue to be used increasingly as we develop new tools and methods, but it will be interesting to see the level of effect that this has on the decision-making process this year. Check out this video below for a little more detail on the new agreement.